Don't forget that 25% off ends 12/31 so take advantage of it ASAP! Remember, to get the discount you MUST click on this link! and don't forget to vote for my entry, #3, in the monogram contest! You always find the best treasures at The Cove.... the plaid headbands are TDF. They really are outstanding. Did we partake of any midnight madness? PS: Yes, we did receive the order, thank you! You always always find the best stuff! Hope you had a wonderful Thanksgiving! Hey! We thought you may like these Juicy Couture Anchored in Couture Studs. While doing a little research for our Ultimate Gifts we stumbled upon these and thought, "Oh these are nautical...Nautical by Nature!" Great finds! Love the headbands. 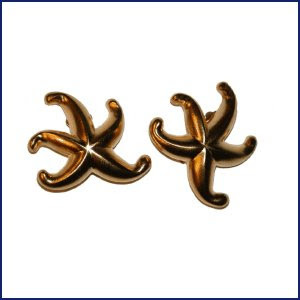 oh, love the starfish earrings!! and the plaid headbands. so cute!